My first EV3 robot: a brick sorter. Build it from a single 31313 EV3 set (plus a few 2x4 colored bricks!). With building instructions and program. How to synthesize a NXT plug from a regular RJ-12 one. Once you master NXT plug synthesis, it's easy to create cables with custom length or compatibility cables to plug your old RCX sensors or motors. Hack a tool to crimp Mindsensors NXT-style RJ12 plugs and make your own NXT cables. Power external devices from your NXT out of a motor port while using this motor (almost) normally. A parts kit to model your NXT creations with LeoCAD. A hack of Power Functions battery box to lower its output voltage in order to power Mindsensors' NXTServo board and RC servo. a LDraw pack to model your NXTServo creations. Some technical information about PF battery pack. Easy detection of small objects interrupting a light beam. A NXT add-on to improve screen legibility in low light conditions. Use a Power Functions remote handset to control a NXT robot. A compact little rover that can be equipped with a wireless camera to explore your house. With building instructions. An ergonomic joystick to remotely control your robots with Bluetooth. With building instructions. Another remote control that uses an acceleration sensor to sense the position of the remote and drive a vehicle accordingly. With building instructions. A robot able to move around along pre-defined paths, and keep an estimation of its position from encoders in its wheels and central pivot. This robot scans small 3D objects to include them in CAD programs such as LDraw. A NXT-based laser sweeping mechanism used to digitize 3D shapes. 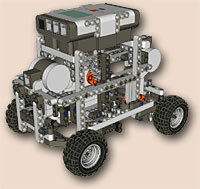 LEGO has its own homepage: www.lego.com, and a page on the Mindstorms system: mindstorms.lego.com.